You are currently browsing the category archive for the ‘Boston Marathon’ category. I’ll admit this writer of the Pork Power blog has gone through a bit of writers block recently. It seems I would begin to start a subject, only to get part way through and decide it wasn’t really what I wanted to say. Over the last few months I’ve had the opportunity to be involved in number of events that involve promoting pork to people who don’t typically interact with pig farmers. From the Boston Marathon in April, to Grandma’s Marathon in June, to the Oink Outing in Edina a few weeks ago, I’ve had a chance to give them a healthy, tasty sample of pork and more importantly talk to them about raising pigs. The marathon events were just plain fun. While I enjoyed interacting with people at the Farmers Market Oink Outing in Edina, I had a number of conversations that made me realize how much people just don’t trust pig farmers anymore… and that makes me sad. It seems there was a time when farming was a noble profession. Farmers didn’t make much money, but they were growing food for people, which was good. It also meant those people were free to get other jobs and not have to be farmers. Somewhere along the way, a few bad apples have ruined it for the rest of us and now the common thing to do is call all farmers “corporate farmers” who practice “factory farming.” Ouch, that hurts. I had people in Edina tell me they won’t eat meat because of the way animals were housed. When I told them about our farm and how we take care of pigs, you could see them make the mental transition to “Okay, now I trust you, but I don’t trust the other people.” So how do I explain to them that the vast majority of pig farmers in MN and the U.S. can be trusted, even if you don’t have the chance to meet with them. I want them to know that with the guidance of our veterinarians and consultants, we can make the right decisions on the welfare of our animals and we don’t need someone else making that choice for us. I’ve never taken the trust of someone else for granted. I’ve tried to teach my kids that trust is an important part of someone’s character; it’s a measure of someone’s worth. So how do I explain to my kids that a whole new segment of society thinks we’re “worthless” and can’t be trusted to take care of the very animals that provide our livelihood. Just as important, how do I get people to trust pig farmers again? “I survived the 2012 Boston Marathon”. That’s the shirt that Dale wants someone to create so that he can buy it. 87° temperatures and running a marathon are two things that do not go well together. Yet Dale was able to stay upright, when unfortunately many didn’t, and run a very respectable 3:45 marathon. Our weekend in Boston was memorable; not only for the heat but for the great opportunity we had to promote pork during the Health Expo. As I walked into the Event Center, I could smell the inviting scent of grilled pork. Even though the place was packed and I couldn’t find our booth, I knew the Pork Power team was there. We had lots of people ask why pork was at the Health Expo. When we tell them how well a lean protein like pork fits into an athlete’s diet, you could see their head nod in agreement. Over and over we instructed people on the proper way to cook pork and how that really does make a difference in juiciness and taste. In the end, our goal was to create a positive impression, to provide a little education and to encourage people to continue to buy pork. Having goals and committing to the hard work and discipline to achieve those goals applies to most everything we do in life, from promoting pork to running marathons. Sometimes things happen beyond our control but that doesn’t make the preparation or the effort needed to accomplish the task any less significant. Simply having the courage to take on a daunting task reflects the true character of a person. 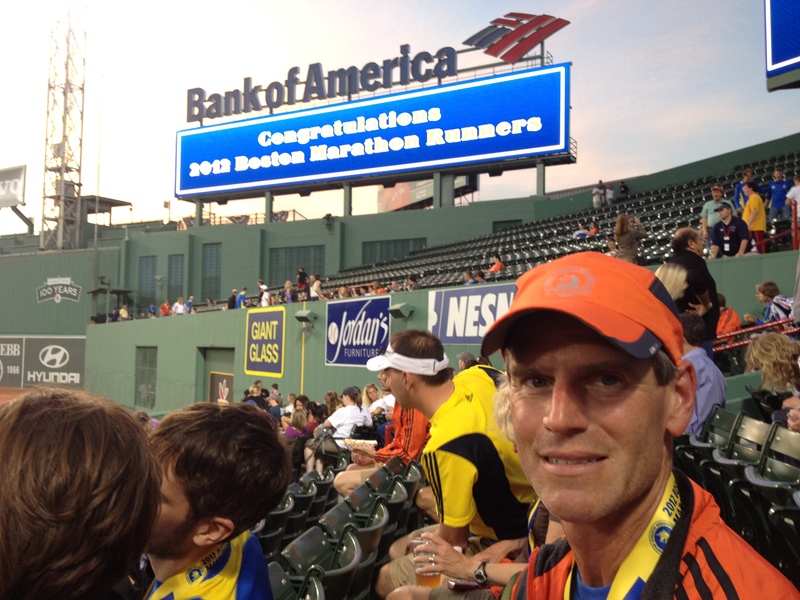 For those of you that don’t know it, Dale is running the Boston Marathon on April 16th. The Boston Marathon is probably one of the most famous marathons. Even people that don’t run recognize the name. Dale has been training very hard, or perhaps I should say diligently over the last 5 months. He’s a man with a plan and he’s sticking to it. I hope that brings him success at the race. The Pork Power Blog got its start about 3 years ago when the MN Pork Board decided to be a sponsor at Grandma’s Marathon. A group of us pork producers, who happen to be runners, decided to share our experiences, both on running and being pig farmers. In April at Boston, the MN Pork Board will be exhibiting at the Health Expo. It will be a great opportunity to share the message of how pork is a lean and healthy protein that fits into an athlete’s diet. It’s going to be a busy time in Boston. Not only do we have Dale running and the Health Expo, but I’m going to be running the 5K on the 15th and I just found out I was selected to be a volunteer at the Marathon. I’ll be helping with the clothing check at the starting line. It should be a great experience. Watch out Boston. The MN Pork Producers and their “Pork Power” are on the move.